In the United States portraying litigation as pathological is a key component of business lobbying groups’ social construction of the legal system. They commission and use questionable social science analysis and misleadingly portray highly publicized cases, such as the McDonald’s coffee spill case. They do so to help characterize civil litigation as dominated by lottery-seeking plaintiffs, greedy plaintiff’s lawyers, and state civil justice systems that are too hostile to business. Together with my co-authors, Ted Eisenberg and Nick Robinson, I recently released an empirical study of litigation in Indian states that contravenes this widely-held view. 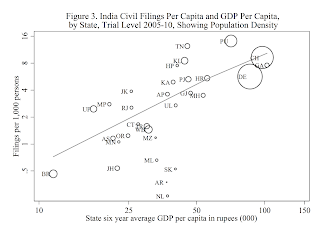 Analyzing over twenty years of data from High Courts and six years of data from trial courts within India, we found that Indian states with higher civil litigation rates also generally have higher GDP per capita and literacy rates (see Figure 3 from page 18 of the article). 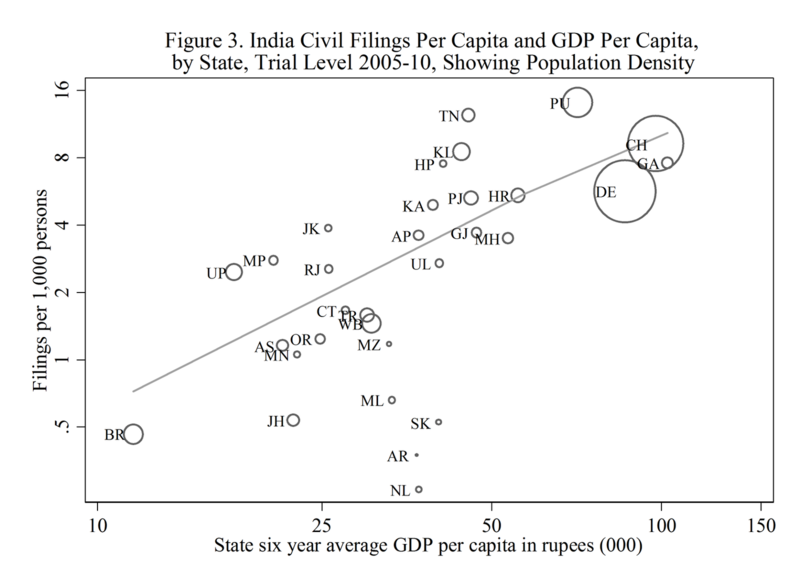 India makes a great case study for examining the connection between litigation and economic development because there is wide disparity between Indian states in GDP and literacy. For example, the literacy rate is 93% in Kerala but 67% in Rajasthan. 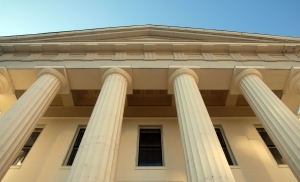 The article presents substantial new evidence that higher litigation rates are not necessarily evidence of an overly litigious society or a drain on the economy; they can be a natural consequence of economic development and improved human well-being. What is even more interesting is that a state’s Human Development Index Score (which is a composite of economic, health and education indicators) correlates even more with higher litigation rates than a state’s GDP and literacy rate. The fact that higher litigation rates are associated with Indian states with a higher HDI score suggests that people are more likely to use the courts to resolve disputes when they are economically, socially, and physically better off. The implications for those who are concerned about the fact that many Indians lack access to justice and courts is that simply improving the courts or macroeconomic growth are not the most important factors in ensuring that people are able to assess the courts. Indeed, assuring access to justice may require governments to ensure economic as well as social (such as healthcare and education) rights and opportunities. Another surprising result was that litigation growth has slowed in the last five years in Indian states (see Figure 12 above from p. 30 of the article). Moreover, courts with higher backlog have had proportionately less growth in litigation rates. This raises the question whether Indian economic growth can be sustained without the well-functioning courts. India’s challenge is not that too many cases are filed but that too few are timely adjudicated. In addition to processing cases faster, other systemic problems within the court system must also be addressed by the Indian government including poor court infrastructure, vacancies on the bench, and corruption. We were fortunate to receive Indian media attention to the findings of the paper (Times of India, Wall Street Journal Blog, and Mint) and we hope that the findings can be helpful to policy discussions within India about court reform.